Baxter wore #34| in 28 games for Carlton, commencing in Season 1949. He booted 22 goals for the Blues and was recruited from Werribee. Baxter was a member of the reserves 1951 premiership team. Baxter had 2 brothers who would also make it to the 'big league', with his brother Ken something of a goal-kicking fiend at Carlton and Bill, a prominent player for the Demons. 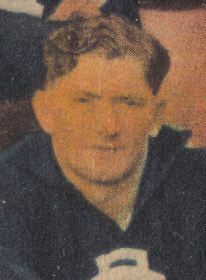 Baxter took up the position as senior coach for Port Fairy for the 1952 season and a playing career that spanned a further eleven seasons, 692 goals (still a Hampden League record) and a senior premiership in 1958. So loved was Bernie in the town that the footy ground's scoreboard was named after him for perpetuity. Contributors to this page: Jarusa , Bombasheldon , molsey , pblue , tmd1 , p(12)terg , dgreen2 , keogh , true_blue24 , Juzz and admin . Page last modified on Monday 17 of June, 2013 10:41:59 AEST by Jarusa. 1986 Rd 18 - Match Preview Vs Swans.